Since I'm trying to get myself back into "new monster mode" I though I'd develop a New Monster Worksheet that I could use to flesh out new monsters. BTW, have I mentioned this thing is for use when developing new monsters? I've tried to make it as system flexible as possible, and know that everybody won't use every space on the sheet. E.g., as a BX/LL guy, I like the use of the "Save as" stats for monsters (instead of the 1e "Magic Resistance" stat). Also, I'm not a THAC0 person, but I know some people are. If you have any thoughts for revision/improvement, please leave a comment below and I'll take them into consideration. 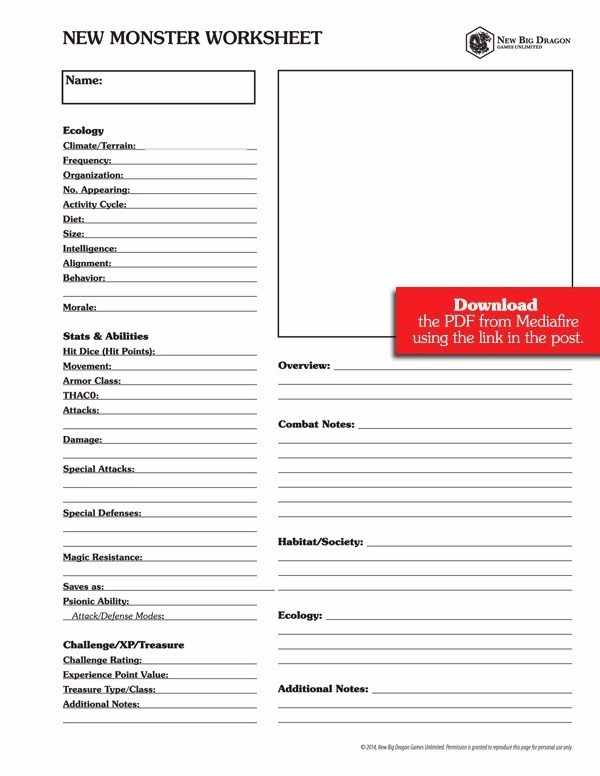 New Monster Worksheet from MediaFire, click here.